As a journalist your most harsh critics are often your colleagues. No-one can tear a story apart and summarise it, often brutally, quite like a sharp minded editor. In the past I worked with one such editor who judged a story on a simple principle, "is it good for the town?". If the story was not good for the town, then there was a reason it was bad for the town. If it was bad for the town, then someone obviously wanted to keep a lid on it and there was almost certainly a public interest in revealing what that was. If it was good for the town, people wanted to talk about it, and who doesn’t like something which is good for the town? The Cork Event Centre is undoubtedly a 'good for the town' story, or in this case, good for the city. But it is a good for the town story to which huge conditions apply. A 6,000-seater event centre, which could play host to big music acts one night and then political conferences the next. A long overdue addition for people in Munster. Construction firm BAM bought the old Beamish and Crawford brewery and won the tender to build the centre on the site, international behemoth in the events industry Live Nation would come on board to run the facility, a vital cog in the wheel to attract large acts and events to the city. As an election loomed in 2016, the two companies were rolled out alongside Taoiseach Enda Kenny to inform Cork people that their long journeys to Dublin and beyond for concerts would be coming to an end. It would be built in two years, one of the BAM bosses told the crowd. Negative media comments about delays were decried. A budget of just over €50m would put the centre in place. The State would put in close to €20m to get the project up and running. Giddy ministers smiled and chuckled with delight at being able to confirm the news. An infamous picture of Enda Kenny throwing the sod, as opposed to turning it, now haunts the politicians who publicly backed the project. Namely Tánaiste Simon Coveney, by his own admission he has staked his political reputation in Cork on the project. He has been a central figure in trying to get the project off the ground and keep it in play. The tide of giddy, happy smiling politicians turned when a senior BAM executive went before Cork City Council a year after the sod turning to break some bad news. The budget had increased, to €80m. A whopping 60% jump. Finer details on design and layout had changed things and now BAM and Live Nation needed more help form the public purse to get things going. The news went down like a lead balloon. Councillors rolled their eyes. But, government would ultimately have to come up with the €10m if the project was to happen. Months and months have gone by, the Government following advice from the Attorney General is now suggesting that €9 million of that extra money must be in the form of a repayable loan to Cork City Council. There are concerns that allocating more grant aid to the project could cause problems. The original tender process may be challenged and it could be back to ground zero for the project. Within the past two weeks barristers working for Cork City Council finalised a legal review of the proposal to make €9m of the overall funds a loan. That advice will not make things easier, Cork City Council is not happy about the loan. To further the woes of the Cork Event Centre some city councillors and local politicians have slammed the lack of transparency on the issue. They say most of the talks on the project have happened in secret, Prime Time requested minutes of some meetings but we were told they couldn’t be released as the process was ongoing. If the city council is to take on a €9m loan to make this project happen, it will need a majority of councillors to vote and back such a move. Given criticism about councillors being cut out of the process to date, getting their sign off on such a loan, may be difficult. Some councillors have told Prime Time they would not back the proposal. So, a 'good for the town story’, has turned into, well, a 'it would be good for the town' story. Last week I spent more time than you should 'Doing Pana', walking Patrick’s Street, chatting to locals. Most laugh when you mention the convention centre, roll their eyes, they all want it. How Cork gets it is the sticking point. Contrast that with a prominent local businessman who tells us, " the Government should go away and give BAM the money and for God’s sake get on with this". Tonight on RTÉ One at 9.35pm Prime Time gauges feelings in Cork on the project. 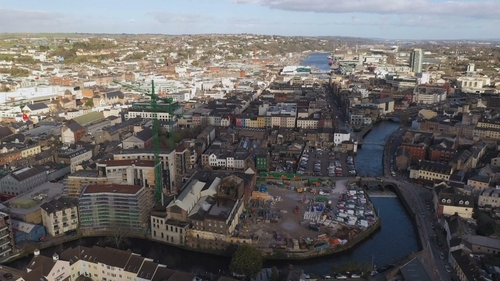 We examine the delays to date and weigh up the likelihood that can Cork make it happen.